When Ewy Rosqvist bought her first Mercedes-Benz, she didn’t have racing in mind. The only girl born to a Swedish farming family, she was encouraged to attend an agricultural college to study veterinary medicine, a career that required her to drive up to 200 kilometers every day on narrow dirt roads. She needed something nimble and quick to get her from Point A to Point B. She didn’t see all that driving as a necessary evil—no, it was one of the best parts of her day. It wasn’t long before she had clocked 220,000 km in the car as she sped between farm to farm, honing her driving skills. By the time her first two years of vet practice were over, she was driving so perfectly that she could finish her rounds two hours before her colleagues. It isn’t known exactly how the two met, but in 1954, Ewy married engineer and racer Ynvge Rosqvist, who came from a family of automotive enthusiasts. Initially, Yngve employed Ewy’s sharp mind as a co-driver for the rallies he would take part in. He’d even give her a shot behind the wheel, and it was such an incredible experience for her that she was bound and determined to take part on her own to see how those years of farm driving would pay off. Two years after her marriage, Rosqvist got her chance. At the age of 27, she was behind the wheel at the Midnight Sun Rally alongside Maybrit Clausson as co-driver. The two didn’t finish, unfortunately, but it was a promising first outing. Rosqvist was getting used to the sensation of speed and competition, and she was hungry for more. She rallied in a Saab 93 during 1957 alongside co-driver and sister-in-law Anita Rosqvist, but the Saab partnership only lasted a year before Ewy bought a Volvo. She honed her skills throughout Scandinavia, but by 1959 she was ready to test herself on the international stage. She and Anita won the Ladies’ Class of the Midnight Sun Rally that year and realized that they might have a chance in the European Ladies Championship, taking on figures like Pat Moss. Two wins and a third place meant that Rosqvist was able to be competitive against Moss. But later in that season, the tides began to turn in Ewy’s favor. The Ladies’ Championship points were not just calculated by points—to even qualify for it, you had to enter a certain number of rallies. Because Moss skipped some events, Rosqvist was holding steadily to the lead ranking, but just by a smidge. The title was to come down to the RAC Rally. When Ewy arrived in England, she thought it was all over for her. She fell so ill that she was confined to a hospital bed and was forced to withdraw from the event… until news reached her that Moss had also withdrawn. It may have been a bit of an anticlimactic end, but Ewy Rosqvist won her first European Ladies’ Cup. By the time she was ready to compete in 1960, things had changed for Ewy. With a championship under her belt, she competed in her first Monte Carlo Rally and, by May of that year, had become a member of the Volvo works team, who outfitted her with a new PV544. With new equipment and a poor performance to make up for, Ewy and Anita stormed through win after win—only for the FIA to decide that they weren’t going to award the European Ladies’ Cup. Despite her success, that lack of a title was frustrating. Until that point, Rosqvist had still been balancing a fruitful career as a vet with her racing. She finally gave that up in 1960, only to be deprived of the reward she’d so desperately been fighting for. And then, to further complicate things, Anita Rosqvist got pregnant and thus sat out most of the 1961 season. When faced with adversity, Ewy Rosqvist did the only thing she knew how to do: she raced even harder. Still with Volvo, Rosqvist dived into the ‘61 season to find that Pat Moss wasn’t her only rival anymore. Anne Hall snatched the Coupe des Dames at the Monte Carlo Rally right out from underneath Rosqvist, who saw it as an opportunity to improve. That year, teamed up with Monika Wallraf, Ursula Wirth, Eugenia Wolko as alternating co-drivers, Rosqvist won the Ladies’ Prize in the Alpine Rally, in Poland, at the 1000 Lakes Rally, and the Acropolis Rally—among others. Thus came her second European Ladies’ Cup. In 1962, she was approached by Mercedes-Benz. They were looking for a driver to sign, and Ewy was looking for a professional racing contract: it was a match made in heaven. It was a tough road at first, with plenty of finishes outside the top twenty. But once the autumn hit, Rosqvist had found her groove. She won the Gran Premio Internacional Standard Supermovil YPF. She won it outright, from every competitor, not just the women. This long-distance rally was a ten-day trek across Argentina, and Rosqvist won every single stage. Not once did she suffer a mechanical issue. She even experienced and coped with the death of her teammate Hermann Kühne. Nothing could stop her. It was an understandably exhausting race. Rosqvist sat out the rest of the season to recover, wondering all the while if she even wanted to continue racing. But the winter break made her itchy to get behind the wheel, so back she went in ‘63—and she showed up with a bang. She was no big fan of the Monte Carlo Rally, but that year she won the Ladies’ Cup in the event, proving to herself that she was meant to be back behind the wheel. But she just wasn’t interested in competing anymore, not like she used to be. Her performances throughout 1963 and ‘64 were good, but they weren’t the prodigious wins she’d been racking up in previous years. At the end of the ‘64 season, she announced her retirement at the age of 35, joking that she was going to become a housewife and learn how to cook. 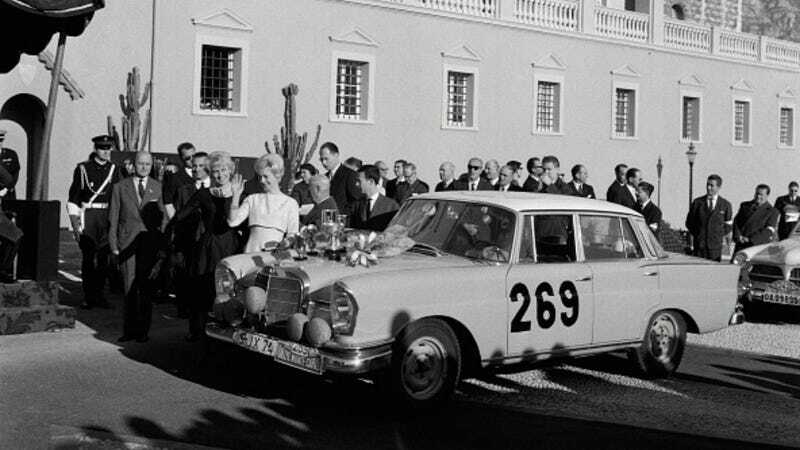 In reality, her marriage with Yngve Rosqvist had fallen through, and she was planning to marry Baron Alexander von Korff, the head of Mercedes’ competition department. Ewy wasn’t ready to give up cars full-time. She didn’t race anymore, but she was a very effective brand ambassador for Mercedes and served as a test driver and multilingual tour guide in a Stuttgart museum for years. It’s unknown if she still takes part in those activities at the age of 89, but she’s still a popular guest at Mercedes-Benz events. And she still proves that there’s no stopping a woman who wants to succeed in multiple venues, even if that means somehow balancing being a vet and winning three Women’s Championships.